It's no secret that Snapchat needs more revenue. The company's business process is improving, but as noted by several analysts, at its current rate of revenue growth, it'll run out of money before it can reach profitability, which is clearly a major concern for the app. Given this, it makes sense for Snap to be looking at new opportunities - though I'm not sure this one is going to work out how they hope. Seeking to capitalize on the popularity of its Bitmoji characters, Snap is launching new, customizable Bitmoji merchandise which will be available within the Snap Store on iOS. As you can see, the new products will feature your Bitmoji character - TechCrunch reports that the products will be able to feature your Bitmoji and/or a friends' interacting in various ways, and on various surfaces. "The Bitmoji merchandise store opens Thursday in the US on iOS only with $2 stickers, $15 coffee mugs, $16 standard t-shirts and notebooks, $22 triblend t-shirts $27 sweatshirts." Cool, right? Wearing a t-shirt of you and your friends' cartoonish likeness doesn't seem cheesy at all, should be a big hit. I guess, the popularity of the option comes down to how much people like Bitmoji - and people do like Bitmoji a lot. The Bitmoji app regularly hovers around the top 10 for utility apps (as per App Annie) and the integration with Snapchat has brought many more users to the tool. It may not hold appeal to everyone, but Bitmoji are popular. Now, we'll see how popular they are in different applications. In addition to this, Snapchat's also rolling out 'Bitmoji Stories', a new way to share "fun, comic strip adventures", which star your Bitmoji avatar, along with your friends'. This harks back to the original BitStrips roots of Bitmoji - BitStrips were big on Facebook back around 2014, with people sharing collaborative comics of jokes and scenes which captured their real-world personalities in cartoonish, Bitmoji form. 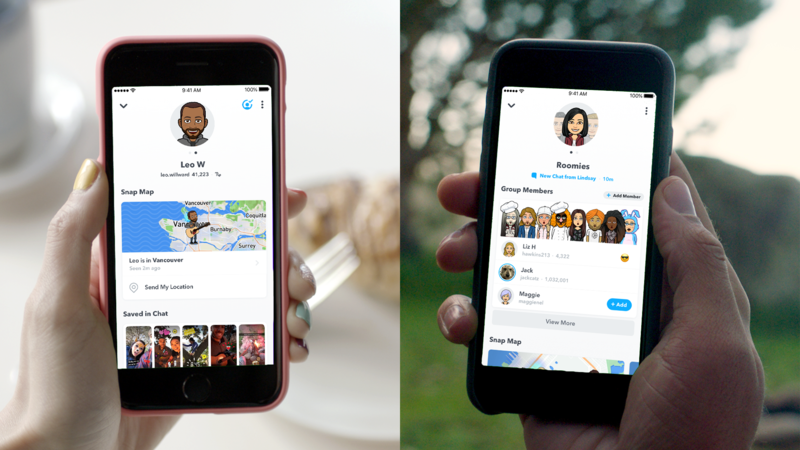 The new variation will be animated, but it follows the same idea, adding another creative option to the Snapchat connection process. And lastly, Snapchat's also adding new 'Friendship profiles' to help compile your interactions with selected friends within the app. "In each Friendship Profile, you’ll find the images, videos, messages, links, and more that you and your friends have saved in Chat, all in one place. Friendship Profiles make it easy to find your favorite memories and the important information you've saved over time. It's the fastest way to find the highlights of your friendship." Similar to Facebook's Memories function, the tool aims to utilize nostalgia to solidify connection with the app. If you see all the moments you've shared, all the Snaps you've created, all the times you've spent together, that might just keep you interacting, even re-sharing those memories and boosting engagement. Like Bitmoji products, that might seem a little hokey, but the stats don't lie - on Facebook, more than 60 million users visit their personal "On This Day" page every day, which is not just Memories, but it does show that such reminders can be valuable. It's a relatively small addition, but the impact could be significant - and considering Snap needs to retain its hold on users, particularly those in older age brackets who might be 'getting a bit old for Snapchat', reminding them of the good times could make a lot of sense. So will Snapchat users rush out to buy t-shirts with cartoon versions of themselves emblazoned across the front? You'd think not, but it's hard to say - and the other options like phone covers and coffee cups could be more popular. I'd bet against it becoming a significant money spinner for the company, but it's another element, a relatively low-cost addition that could help them bring in more revenue, while also boosting exposure for the app offline. And they might just take off. Snap needs to take some risks in this regard, try some things out. Maybe, Bitmoji will be key.